Another haul of cocaine seized from alleged traffickers has been offloaded by the U.S. Coast Guard at Port Everglades. Weighing about 6 tons and worth an estimated $179 million on the streets, the drugs were confiscated during six seizures between late February and mid-April in international waters of the Eastern Pacific Ocean, the Coast Guard said. The cocaine is being offloaded from the Coast Guard Cutter James, one of three cutters that were involved in the drug seizures. * The Coast Guard Cutter Bertholf was responsible for one case, seizing an estimated 1,653 pounds of cocaine. * The Coast Guard Cutter Bear was responsible for two cases, seizing an estimated 6,029 pounds of cocaine. * The Coast Guard Cutter James was responsible for three cases, seizing an estimated 4,313 pounds of cocaine. The latest seizures are part of the ongoing international effort to deter drug trafficking in known transit zones off of Central and South America. 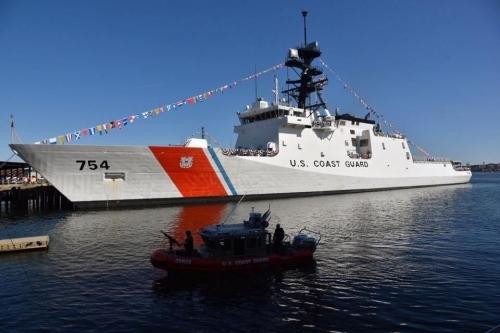 "The U.S. Coast Guard works with other U.S. agencies and law enforcement officials from partner nations in the region resulting in the seizure of thousands kilograms of cocaine every year," said Capt. Mark Fedor, commanding officer of the cutter James. "Each successful interdiction is another successful step towards protecting our respective borders and citizens from the rising threat of transnational criminal organizations." This recent drug offloading at Port Everglades comes just weeks after the Coast Guard Cutter Lagare delivered 13 tons of seized cocaine and marijuana to the port. A portion of the seized drugs are preserved for evidence while the rest is delivered to federal authorities to be destroyed. � Copyright 2018 Sun Sentinel.